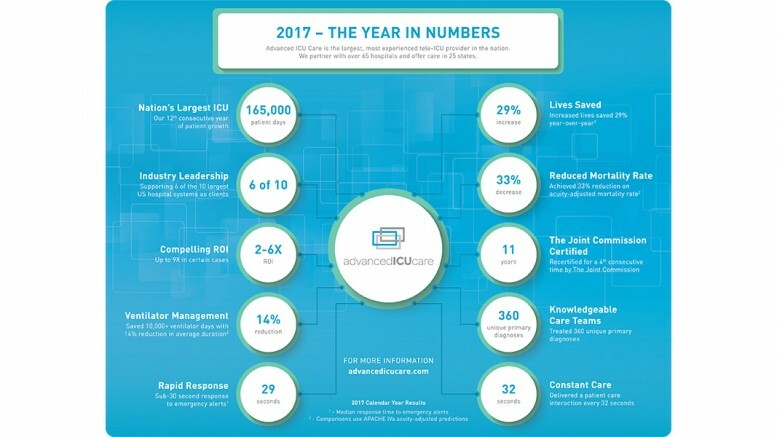 Advanced ICU Care, one of the nation’s leading providers of high-acuity telemedicine services, today released key 2017 clinical performance data and accomplishments, demonstrating continued impact, leadership and growth within the industry. The statistics highlight Advanced ICU Care’s success in improving clinical outcomes and growing adoption of its tele-ICU services across the country. Currently, the company works with over 65 partner hospitals in 25 states, and its list of clients includes six of the ten largest U.S. hospital systems. Advanced ICU Care has over 12 years of experience in delivering tele-ICU care on a national level. Providing care by U.S. board-certified intensivist-led care teams serving patients and hospital clients from nine dedicated tele-care delivery centers, the company is committed to improving patient outcomes and enhancing the state of the art in collaborative ICU practice. *Results reflect the 2017 calendar year. Comparisons and projections use APACHE IVa acuity-adjusted predictions.